Go to your managed list on SellHack click the export button*. Use the Filters option to find/select certain prospects. Next, click the export button and click Replyify. You will be prompted to select a campaign (this is optional). On the right hand side of this page, you will see what SellHack fields are mapped to Replyify for use with Variables in your campaign editor. You can edit the mapping here. *If this is your first time exporting contacts from SellHack, you will need to authorize and connect your SellHack and Replyify accounts (see below). **If your SellHack account is connected to the wrong Replyify account, log in to SellHack and log in to the correct Replyify account in the same browser. Then click this link then select remove for the SellHack token. Go back to SellHack & try again. Don't like reading? Here's a video tutorial. You can upload a file by clicking on the 'Add Contacts' button of the Contacts page. Select a .CSV file from your computer, then click 'Upload'. You will then be prompted to map the data in your file to a corresponding Replyify field. We automatically detect and suggest a Replyify field to map to. If we don't suggest a field, you will be prompted to ignore the data field with the dropdown 'Don't Import This Field' OR select the option to 'Add a new custom field' with this data. Click 'Save Fields' when you are satisfied with your selection. 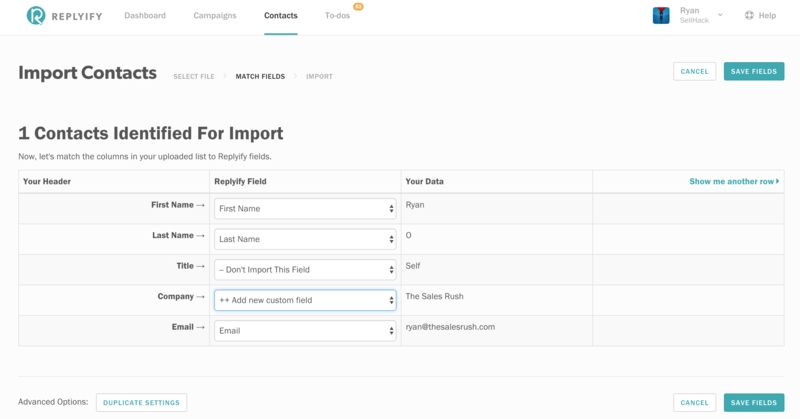 Once your fields are saved, please select an option to assign your contacts to a campaign now or to skip for now and add them to a campaign later. Once you've made your selection, click the 'Start Import' button. The import process will begin, and you'll be notified (shortly) via email when the import is complete. In the meantime, go find some more prospects on SellHack.com. Replyify has several account safety features that handle duplicate contacts which are listed below. Duplicates are identified by a 'Unique Identifier' added by you during the contact import or by the email address, which is the default duplicate detection data point. If you import or upload a duplicate contact, Replyify will NOT create a duplicate contact record for a contact(s). Sometimes, though you may have additional data that wasn't included in your first upload/import, so if you re-upload your contacts, Replyify will append the new data to the contact record. Pro Tip - if you want to bulk add contacts to a new campaign, you can re-upload the contact file and assign to the new campaign, just check out point #2 below. 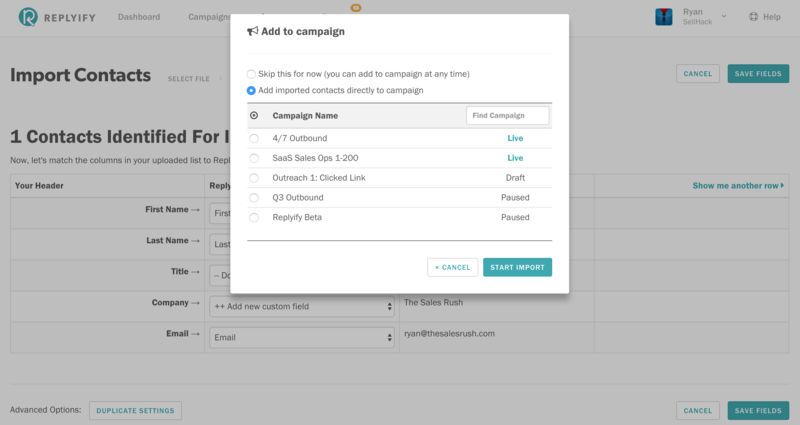 By default, your campaign(s) have a Setting to "Prevent contacts in other campaigns: set to Enabled." This prevents accidentally adding contacts already in a campaign to a new campaign. However, if your campaign ended or you have an even, like a webinar, and want to add contacts to an additional campaign, just edit the new campaign to Disable the safety setting of preventing contacts in multiple campaigns. If you are the Admin of a team of 1 or 100 people, you have the ability to prevent duplicates in your team member's accounts. Duplicate Prevention works by suppressing contacts that are already in another team members account. Whichever team member adds the contact first takes priority. You can enable or disable this setting in the Suppression Rules of the Contacts Section. ps - if you already have contacts uploaded, and want to assign them to a campaign, here's a helpful article that explains this easy process step by step.